Dutch Top Fuel Dragster racer Lex Joon moved to Top Fuel Dragster in 2004, contesting the season in a Top Fueller hired from Knut Söderquist. The plan was to spend the year seeing how Lex fared in Top Fuel whilst trying for the best possible Championship finish, with the eventual aim to run his own operation. The plan to run a self-owned car came a lot quicker than most were expecting, and the MPM Top Fuel team will be contesting the 2005 season with their own operation after the MPM Top Fuel Racing Foundation purchased a state-of-the-art car from NHRA team Baca Family Racing. Eurodragster.com has stayed in close contact with Lex Joon and Team Manager Gerda Dijkstra since the end of the 2004 European Championship season to bring you a diary of their acquisition of the new race car, as well as the recruitment of crew and all of the other factors which go up to build a professional Top Fuel team. Lex Joon will be campaigning his own Top Fueller in 2005. Lex has hired a car from Knut Söderquist this season but with a year's experience on his belt will be striking out on his own next year. "We had a meeting with our sponsor MPM Oil yesterday, and they told us that they wanted us to own our own car", Lex told Eurodragster last night. "We are looking at options, I have already had people try to sell me their cars! We want to buy a complete operation with up-to-date parts and tune-up. We aim to get the car in January which gives us plenty of time to get car and a crew together in time for the season." Lex said that he and partner and Team Manager Gerda Dijkstra would be looking for an operation when they go to the USA in a few weeks' time, but Gerda added that they already have a mole on the other side of the Pond. "Tom Hoover has already been looking around for us", said Gerda. Lex Joon is looking for crew to join his new Top Fuel operation in 2005. If you were tuned in to Eurodragster News on 13th September you will recall that the MPM-backed racer has decided to purchase his own operation after hiring a car from Knut Söderquist in 2004. "The plan is to contest the whole of the FIA Tour in 2005, as well as to do some testing and match racing", said Team Manager Gerda Dijkstra. "But one of the things we have to do right now is to start to bring our crew together. We are thinking of a mixture of Dutch and British crew members." 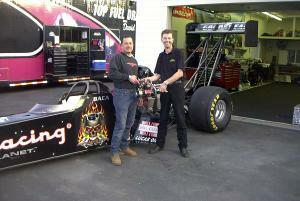 Dutch Top Fuel Dragster racer Lex Joon has acquired a Top Fueller from US racer David Baca. The MPM-backed team concluded the deal to buy David’s 2003 car at last week’s AC Delco Nationals at Las Vegas. "We are really excited, and David was really excited about the whole deal" said Team Manager Gerda Dijkstra. The new MPM dragster has a prestigious history, having taken David Baca to top qualifier at the 2003 US Nationals at Indianapolis with a 4.499/326.32. "If you wanted to put a Top Fueller together then this is what you would build", said Gerda. "We could take this car to the Finals at Pomona next week and qualify in the top half of the field. There were other parties interested in buying the car but David told them "I’ve already got a customer"!" The car comes turnkey with an engine between the rails as well as two spares. "We knew exactly what we wanted and we got it! ", said Gerda. "Everything is A1 quality and there are a lot of nice touches. For example we have titanium headers and titanium valve covers. We have the very latest Racepak datalogger, and we’ll be the first in Europe to run a setback blower!" The deal was done by the MPM Top Fuel Racing Foundation, a new foundation set up between primary sponsor MPM Oil and Lex Joon Racing. "We have a beautiful partnership with MPM", said Lex Joon. "They are more partners than sponsors and we are very pleased and proud to be taking this huge step in association with them." The dragster will arrive at Lex’s Zaandam shop early in the New Year. "After Pomona David will go back home to San Francisco and prepare everything", said Gerda. "We will join David on the Tuesday after the NHRA Finals. We are looking at whether we can buy a trailer out in the USA, if not then we will put the dragster and spares in a container. The car will arrive here at the end of January or in early February." Lex’s call for crew here on Eurodragster in October was more than successful as the MPM Oil team have a full complement of crew as a direct result. Gerda said that the team will be collecting early in the New Year to start to learn their way round the new car. "When the car has arrived then we will train the crew", she said. "The US teams can strip a car in ten minutes and we want our crew to do the same. 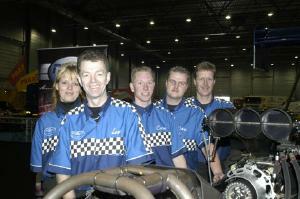 We will be going for the FIA European Championship in 2005!" 2004 FIA European Top Fuel Dragster Champion Andy Carter has announced that longtime Crew Chief Eddie Corr has left the team to join Dutch Top Fuel Dragster team Lex Joon Racing. Eddie joined Carter Motorsport in 1995 and in his nine years with the team tuned Andy to two FIA European Championships, European ET and speed records, the still-talked-about side-by-side first 300 mph passes with Barry Sheavills, a number of event victories, and several track records. "I got the surprise call last night and was even more surprised to hear that Eddie has decided to join Lex! ", said Andy. "I saw the potential in Eddie after he joined the team in 1995, and shortly afterwards I asked if he would like to be the team Crew Chief. As most will know he has more than risen to the task. Eddie's record speaks for itself, we have won two FIA Championships, we hold the European records, we have been over 300 mph more than anyone else, and we've won several events over the years. He also went to the USA with me in 1997 when we were looking at racing there. Eddie is an absolutely first-class guy and I consider him to be one of the best Crew Chiefs in Europe. I would like to thank him for everything he has done for me and wish him all the best at Lex Joon Racing." "I've worked with Andy since 1996, eight of those years as Crew Chief", said Eddie. "Andy took a chance on me tuning his car, and we learned a lot about running Fuel cars, and now we have a record unrivalled in the sport in Europe. "Andy is probably the hungriest driver I've ever worked with, in any motorsport, and the team we built is the best in the sport in Europe. "We’re on good terms, but I know he's the last person I'll want to line up against! "When you spend that long with a team, it becomes like a family and so it's with some difficulty that you make a decision to go elsewhere. But I have, and we'll see the results next year. See you all at the track!" "I am very honoured and thrilled that Eddie has decided in favour of our team and programme", said Lex. "When we made the agreement to buy a complete turnkey car from the USA we knew that we needed a tuner who had the know-how and who is capable of making the right decisions. "Although we had offers from respectable tuners on the NHRA circuit, we didn't hesitate for a moment when we knew that Eddie was available. With the operation we have got from the States, Eddie has the possibility to work with the latest technology, from the data logger to engine components. 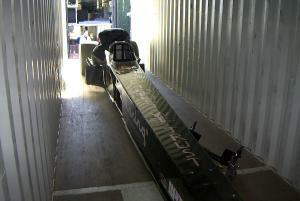 Some of the equipment used on the MPM Top Fuel dragster is years ahead compared with the dragsters in Europe. 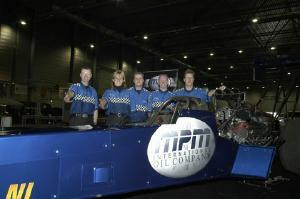 "Although MPM Top Fuel Racing is a new team, all of the ingredients are in place to go for the FIA European Championship title in 2005." 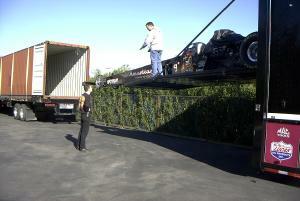 "David Baca and his guys were going to help us out to load the car and parts into the container", said Gerda. "The only problem was that the container didn't arrive! Eventually David had to let his guys go because it was Christmas and they all had flights home to their families. When the container didn't turn up I started to get worried so I called MPM Oil back in the Netherlands and they started to call around. They managed to track down a container on Wednesday but there was no truck or trailer to bring it to the Bacas' Shop. So David called one of his truck drivers who had a trailer but then the container didn't turn up anyway! 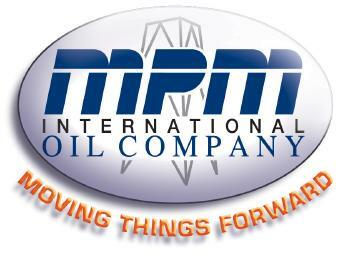 "MPM Oil made a fuss for us and we got the next available container. David's truck driver went and fetched it for us and brought it to the Shop. We had exactly one hour to put the car and parts in the trailer because David was going home for Christmas. We had no means of getting the container off the trailer and onto the floor so we had to use the tail lift on David's race trailer to pick up the car and then reverse the container up to it. We got everything into the container in the hour and then Lex and I stayed on to secure everything. I bubble-wrapped all of the delicate parts including the rear wing and spare engine. It all got done eventually and everyone did a great job." 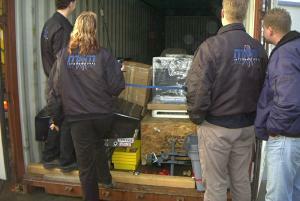 The container was then driven to the docks where more problems arose. "We had to guarantee that there was no petrol anywhere in the container, and we had to prove that there was no fuel in the car, and that the battery was safe", said Gerda. "We even had to activate the parachute release so that it wasn't sprung!". Whilst waiting for the container to turn up, Lex and Gerda went shopping. "We bought a tool chest and tools from Triple T, and we got lots of nice stuff from Home Depot! ", said Gerda. "We spent hours in there!". 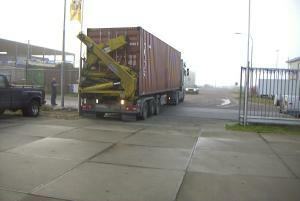 The container is due to leave tomorrow and is scheduled to arrive in Rotterdam on 3rd February. "We should have the car in our workshop on 4th February", said Gerda. "We have a busy schedule then as we need to become familiar with the car, and put everything together, and the car will need to be painted. We are having this car airbrushed - as it is now our car we don't have to use vinyls. The design will be similar to Joey Bon's Top Fuel Bike and it must be ready for the first weekend in March as we will be displaying the car at the Netherlands' biggest car show. "We would like to say a big thank you to MPM, David Baca, Kevin, Jeff, Rocky and Dennis for helping us out, not only during that week but also on all the occasions when they took the time to answer all our questions." 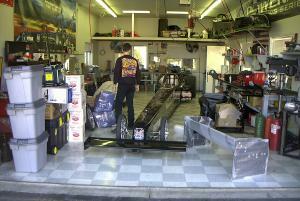 The new MPM Top Fuel Racing Team dragster arrived at Lex's shop on 4th February. As well as Lex and members of his team, representatives of MPM were in attendance as well as members of the media. 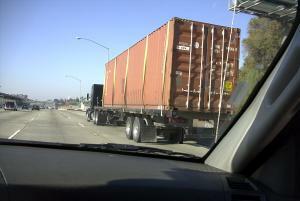 Lex and Gerda were relieved to find that the inside of the container was just as they had left it in California. "The car was in the Baca Family Racing shop in San Francisco only a few weeks ago, and now it's here", said Lex. "It's really nice to have it here. We have had a lot of attention today, the guys from MPM were here and they were very happy indeed - they didn't realise how good the car is! They toasted the car with champagne. We also had a newspaper here, and they will be doing a feature over this weekend." Lex said that the container turned up bang on time and that everything was in order. "We were very pleased to find that everything was still where it had been packed", he said, "we only had a couple of hours to pack the container and secure everything when we were in the USA. We're very relieved!" Now that the car is in the workshop, the MPM Top Fuel team will be checking their inventory of parts and preparing the dragster for painting. "We have to take off all the decals, and remove the wings", said Lex. "The body panels are to be painted dark blue, and then the MPM design will be painted on which will take about a month. Meanwhile we will be looking at the spares and training the new members of our crew. Our Crew Chief Eddie Corr will be coming over with the experienced team members in early March for a training weekend." The MPM Top Fuel Dragster was officially unveiled their new Top Fuel Dragster at the Race and Rally Show in Den Bosch on 4th March. 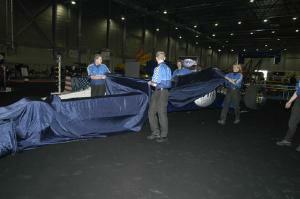 In front of a large number of press, TV and spectators the team pulled away a sheet to reveal the dragster in MPM's corporate blue. "We were a bit late, everyone was waiting for us! ", Gerda told Eurodragster.com. "There were four of us round the car holding the sheet, then Lex gave the signal and they removed the sheet. There were lots of flashes from the cameras and applause. It was nice to do it like that!" Lex Joon Racing has a four hundred square metre stand at the Race and Rally Show, featuring not just the MPM Top Fueller but also Joey Bon's Top Fuel Bike, Robert Koper's Pro Mod, and Jessica Selles' Junior Dragster. "We had enough room to have our trailer in there, but it is still being worked on", said Gerda. After the presentation to the press, Lex was interviewed for a popular motorsports TV programme. 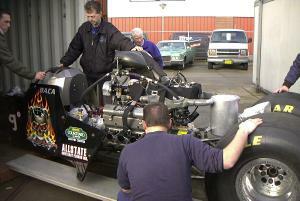 "The guys couldn't believe that the car has eight thousand horsepower! One of the guys got in the car for the cameras and he had to do it a few times because he kept forgetting to pull in his elbows! The car is also up on air jacks so it was a bit of a climb to get in. We gave him an MPM Oil barrel to use as a step." The MPM team will all be together for the first time next week as Crew Chief Eddie Corr and the two English members of the crew will be flying out to Zaandam for a weekend working on the car. "The car is race-ready but we will be training", said Gerda. "This will be the first time that Eddie has seen the car in the flesh and he is very excited. We have been swapping lots of E-Mails but there is no substitute for being there." The MPM Oil rig will be towed to Santa Pod by a tractor unit supplied by sponsor VOS International Logistics. "VOS International supplied us with a tractor unit last year, and they have renewed their sponsorship for 2005 so we are very happy about that", said Gerda. A few finishing touches remain to be done on the car and trailer before the MPM team depart for the Easter Thunderball at Santa Pod Raceway. You can see a full-length picture of the MPM Top Fueller on Lex's web site at www.lexjoonracing.nl. Stay tuned to Eurodragster News and to this page for more entries in Lex Joon's winter diary, and for all the news from the MPM Top Fuel pit visit Lex's web site at www.lexjoonracing.nl.